The awesome metallic cover defeated the self-service bar code scanner in W. H. Smiths! So I typed the number in... and it said "Batman Arkham price £3.50". Oops. I got it cancelled and eventually it did scan... "Batman Arkham price £3.50". I think the series may go off awesome metallic covers for the rest of the story. It did eventually scan correctly at the staffed counter. Incidentally, have you seen this month's "Batman Superman" - I haven't. Sadly, Lew, Titan don't do a recap. I can often forget what has happened (I lead a busy life and read a lot). Yes, I check Wikipedia, but a recap, like Panini do, would be helpful. I don't buy any of the DC reprints, Robert, so I don't know if the latest Batman/Superman has been released here or not. Good hunting! That's what I thought, Parry. A 'story so far' box is essential for bi-monthly comics but for some reason they don't bother. Another reason I don't buy them. In a world where Panini produce multiple quality comics monthly and on time, how can Titan have produced such a forgettable inconsistent range? Robert, I'd have just paid the £3.50 in your situation - it's a £1.49 saving on the actual cover price! Shop's mistake, not yours. Though why would it scan as Batman Arkham anyway? That title was discontinued a while ago, wasn't it? There have been numerous mistakes (printing errors, errors with next issue sale dates, etc.). The Titan Facebook page is filled with numerous complaints. They fail to keep people informed. Titles have been cancelled, but because no-one knew, people continued to check WHSmith. Eventually, as happened with their Supergirl title, Titan told me it had been cancelled. They informed me that they had communicated with subscribers, but had been unable to inform all readers. Unable to inform all readers?!!! What a shame the internet/social media has not been invented. Could they not have informed readers in the editorials of their other titles? They have often copied/pasted "next issue" sale dates incorrectly. One issue of The Flash had a next issue sale date that was a month behind. It feels like their superhero range is an afterthought. Unlike Panini, there isn't any consistency. They cancel titles and then claim they were mini-series. Their website is rarely updated. Their interaction on social media is inconsistent. When titles disappear, it can be weeks before you find out why (why not just put out a tweet?). And when I tried to subscribe to their Batman/TMNT title, the subscription internet address led me to a broken link. I was also sent to a dead link when I tried to subscribe to their Batman relaunch. I grew up at a time when London Editions Magazines, owned by Egmont, put out DC titles consistently and efficiently. Panini had a Batman title for about 3 years. With Titan's reprints, we've hit rock bottom. I wish someone else had the licence. That's not to excuse their poor record of response to readers, but just to explain a possible reason why their titles suddenly end. Thanks for the post, Lew. I don't mind titles ending - that's business - but it's the lack of communication. It'd be quick for them to post an update on Facebook such as "This or that title has been cancelled." Instead, they keep people guessing. Like if a title switches to bi-monthly frequency, they don't always announce it. I think their communication could be better. Yes, a change in frequency can often be a last-minute thing but they could still announce it on Facebook. It's as though they don't want to appear negative, but by ignoring readers it draws even more attention to it! Yes, I couldn't fathom why they were even bothering to reprint Eternal. I feel the same way about this Metal storyline. As I stated here previously, the lack of recaps in the Titan books is off-putting. Life can be busy. When you haven't read a comic for 8 weeks, especially a reprint title featuring similar stories, it can be hard to remember what happened. With Panini's Marvel titles, the recaps are helpful ("Oh, yes, I remember, Deadpool was shot into space..."), but Titan don't do recaps. I often forget what has happened. If they did recaps, it'd be helpful. I appreciate Titan has to be bi-monthly if the alternative is cancellation. But they don't seem to have a long-term plan. If, for instance, Panini had to go bi-monthly, I doubt they'd reprint stories that would take two or three years to complete. They'd probably advise us to buy the Panini trades - and would concentrate on shorter arcs. But, yes, Titan will take an age to reprint certain arcs going by their bi-monthly schedule. I can't help but think sales would increase (yes, I know the market is crowded) if they took on board the many criticisms. I've spoken to some folk on a forum who have complaints similar to mine: the inconsistency of the range, the lack of information when a title switches frequency, the lack of recaps (this is a BIG complaint on a forum I visit). Titan really need to up their game. I only say this as I remember a time when the likes of Egmont, LEM and Fleetway put out great DC reprints. I will say one thing about Titan: at least they are consistent when it comes to inconsistency. Today is Wednesday 9th May. 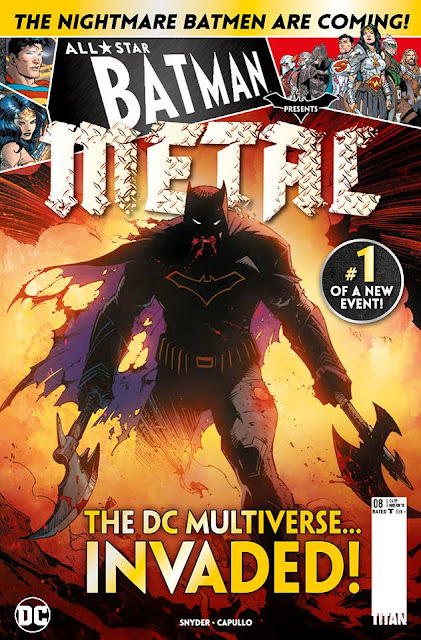 A new issue of their Justice League title is out. On the inside back cover, the next issue is listed as being out 10th May. Which is tomorrow. So it's now a daily title, is it? They do this numerous times. It's a guessing game. Obviously, the next issue won't be out tomorrow, but when will it. It's a guessing game whenever one enters WHSmith to buy Titan's titles. Like I said, they have done this numerous times. Panini don't do that kind of thing, mistakes are rare. I know Panini is a bigger company than Titan, but the Titan editors seriously need to get a grip because these amateurish mistakes are beyond embarrassing now.